A water colout painting by Claude Buckle showing a typical fishing harbour with riuins in the background. This picture captures a typical harbour scene showing moored boats and some ruins in the background. The location of this picture is unknown but probably somewhere in the UK. The appeal of the picture is that the boats are quite brightly coloured. 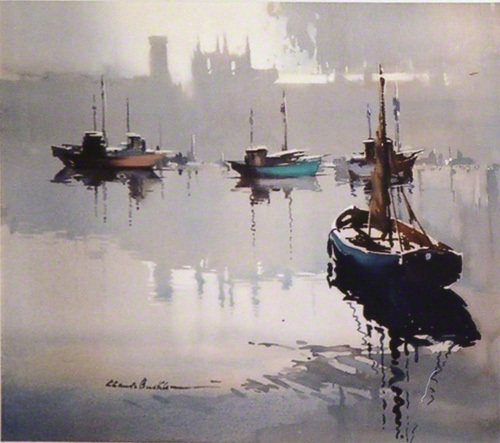 The misty background is a characteristic of a Claude Buckle painting.Courtesy Hilary Blake. Created in 1967.